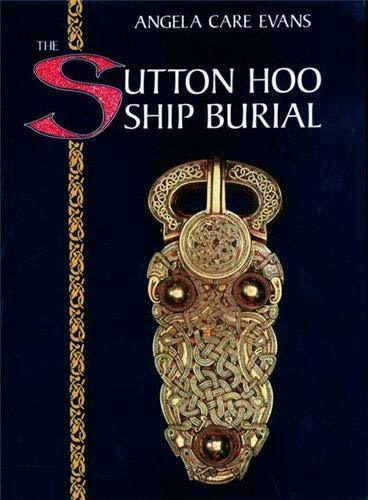 The summer of 1939 saw one of the most exciting archaeological finds ever dug from British soil, an undisturbed Anglo-Saxon ship burial at Sutton Hoo, near Woodbridge in Suffolk. The ship, nearly 30m long, had been dragged uphill from the estuary of the River Deben to a royal gravefield and buried beneath a large circular mound. Amidships, in a textile-hung chamber, a sumptous burial was laid out unique in its glittering wealth of jewellery and unrivalled in the variety of objects that had been selected to represent every facet of the dead man's life. Gold and garnet jewellery, silver from the eastern Mediterranean, drinking vessels with silver gilt fittings, a magnificent helmet and parade shield, a lyre and sceptre were amongst the spectacular finds excavated in two hectic weeks just before the outbreak of World War II. Although no remains of a body survived and no personal possessions were found, the gold and garnet regalia alone implied that the burial was that of a king. But his identity remained elusive until research resulted in a date of 625/30 for the latest of a collection of small gold coins found in the ship, suggest that it may have been the grave of Raedwald, king of East Anglia, who died in 624/5. In this new edition of the survey first published in 1986, the excavation of the ship and its contents are described and illustrated and the results of many years' research at the British Museum are summarised. It also brings the story right up-to-date and includes illustrations of the most recent excavations.